We are looking for HGV drivers to join the team on our prestigious distribution contract, based in East Sussex. Looking for both day and night away drivers. Call 01580 881777 and speak to Steve/Dave/Jess to arrange an interview. 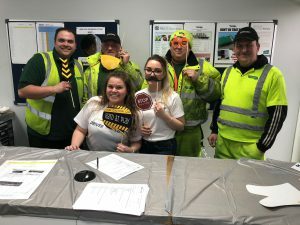 The search for British Gypsum Driver Of The Year has begun and the team at Robertsbridge decided to mark the launch in style. 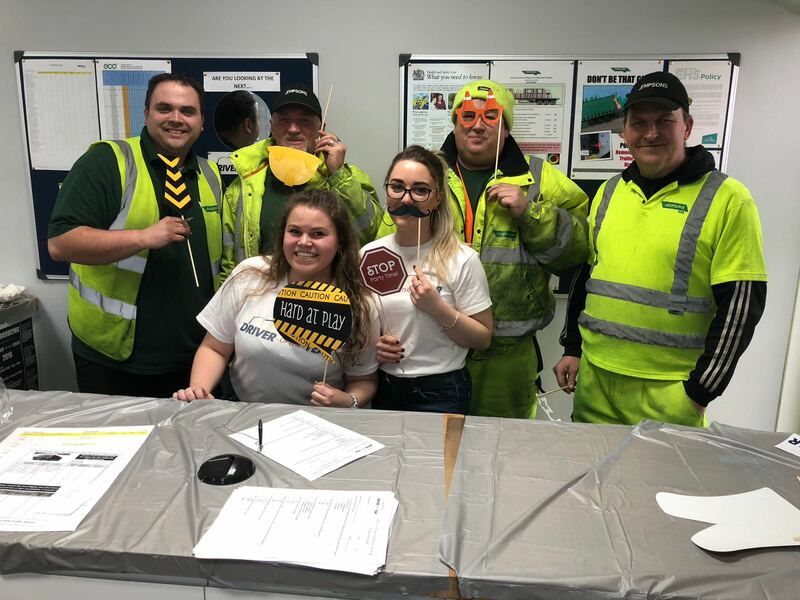 Jess Tallis and Ashlei Burgess organised a fun-filled event which saw drivers popping in for coffee and home-baked treats, picking up info packs, taking part in quizzes and even posing for some snaps, complete with props! The observation period for the contest, which concludes in September, sees the drivers assessed via vehicle telematics, driving infringements and accident stats. Good luck to the team and watch this space! When did you start working at Jempsons? C: September 2016. I came in because they needed an extra pair of hands. S: I used to check the tachographs against payroll when they were the old wax discs. Technology and legislation have changed the way we work hugely. C: We have now centralised all personnel records and they are filed in one office, to keep information safe and up to date with Data Protection regulations. What do you like most about working for Jempsons? S: The office is extremely friendly and we have a laugh. C: Yes, for me, it’s the people. I miss work if I am away. I also like the role because it’s varied and very black or white. Everything has to balance and it’s all very logical. I am not a grey area person! Are there any anecdotes from your time in the office? Both: What happens in the payroll department has to stay in the payroll department! This month we are bringing you an insight into the diary of British Gypsum Contract Manager Stephen Parker, 46, from Faversham. 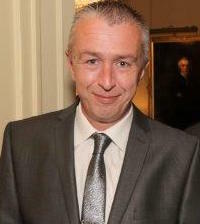 He works at the Robertsbridge office and joined the company in 2014. “My role within the company is to manage the company’s activity on our main contract with British Gypsum, which is for the distribution of plaster board and related products across London and the south east. “Our main areas of focus are safety and the zero-harm culture, and our on-time delivery performance which is set at 99.5 per cent. These requirements go along way to shaping my work load on a day-to-day basis. “This is my average Monday. My alarm is set for 5.50am. I have a coffee and check emails on my phone to ensure there are no early morning issues at Robertsbridge. I aim to leave home between 6.45-7.15am. It’s a 39-mile journey from Faversham to Robertsbridge, which usually takes just over an hour, so I generally arrive between 8-8.30am. “Not that I am a creature of habit, but it’s coffee time while my PC boots up, and then I catch up with the team in the office and establish if everything and everyone is OK, and that everything is running on time. “Generally, on a Monday, once I’ve checked and responded to any emails, it’s time to generate the weekly driver bonus sheets, which takes a little over an hour, taking various information feeds from our systems. This is then emailed to all relevant stake holders and displayed on the notice boards for the drivers. “There is a morning production meeting with the customer at 9.45am, which is normally attended by our Operations Manager, and following this we generally catch up with any issues or workstreams that have come from the meeting. “Next is a 5S housekeeping check on the two areas of the site that are my responsibility – the unit/car park and the diesel pumps. Once completed, these need to be recorded and any corrective actions arranged and documented. “Back to the office, now it’s time to update the KPIs for the previous week, and display them on the notice board. “With safety, one of the key business requirements, safety-related conversations are recorded through the customer’s system, so there’s some admin required for anything relevant. “Between 12-2pm I try to just make myself available to cover the phones or the front desk while the operations team have their lunches (as I tend not to). “As we get into the afternoon, I again review and respond to any emails, customer requests, conference calls, any of the previous week’s payroll anomalies or anything urgent that comes along. “There are always project work streams, driver development, KPI and safety reports as well as customer-specific tasks to be attended to.